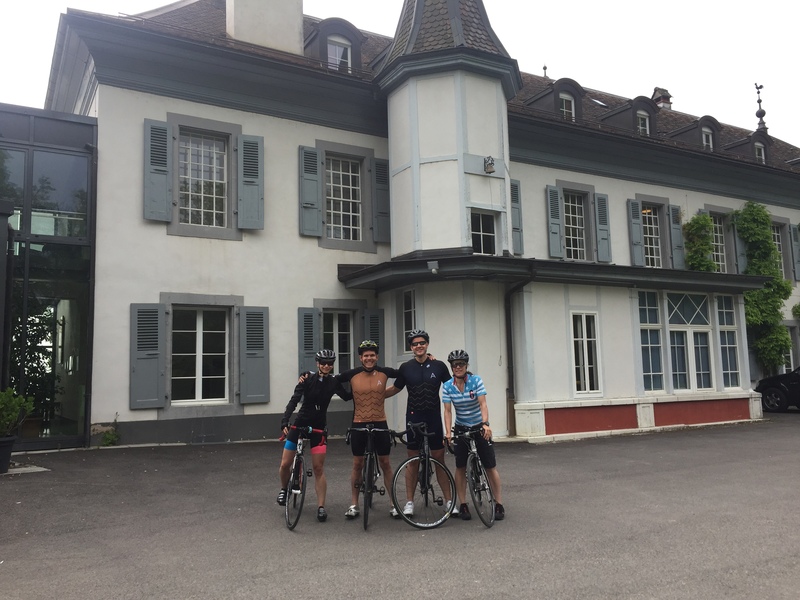 The 18-20 May Switzerland Cycling Camp took place at the Chateau de Bossey, near Geneva, and was attended by local and foreign athletes, all of them preparing for an event in the summer, so the level of the group was advanced. I planned route that would train the hills mostly, and ascending the main cols of the area, but also providing great views and scenery. We met at 10am at the Chateau de Bossey where the participants would stay during the weekend, and started our first bike ride at 10.30. The weather was looking good for the day, but not great for the weekend, so I decided to lengthen our day a little and make the most of the sunny weather. We started on the lake road by crossing Nyon, a small but ancient Roman town. 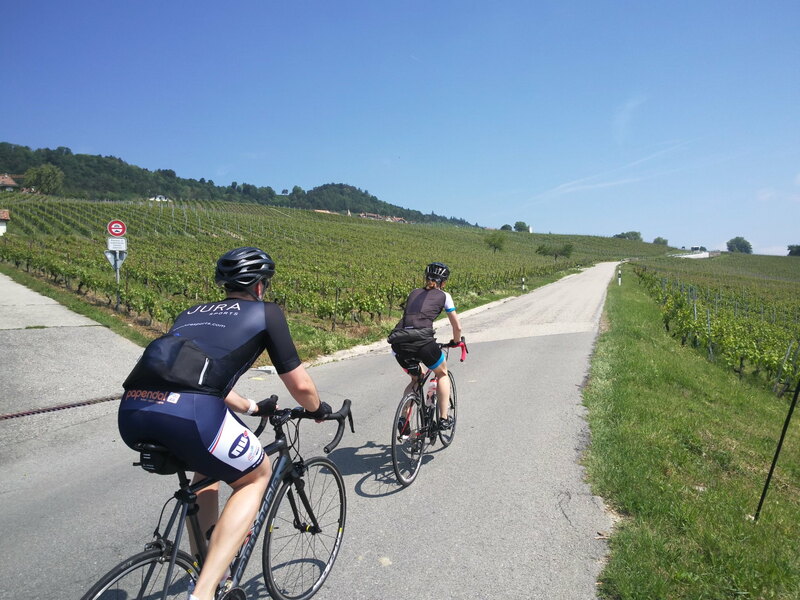 We then headed towards the vineyards of La Côte with short but very steep climbs through Châtel, Mont-sur-Rolle and Féchy, before finally reaching Aubonne and up towards the plateau at the foot of the Jura. 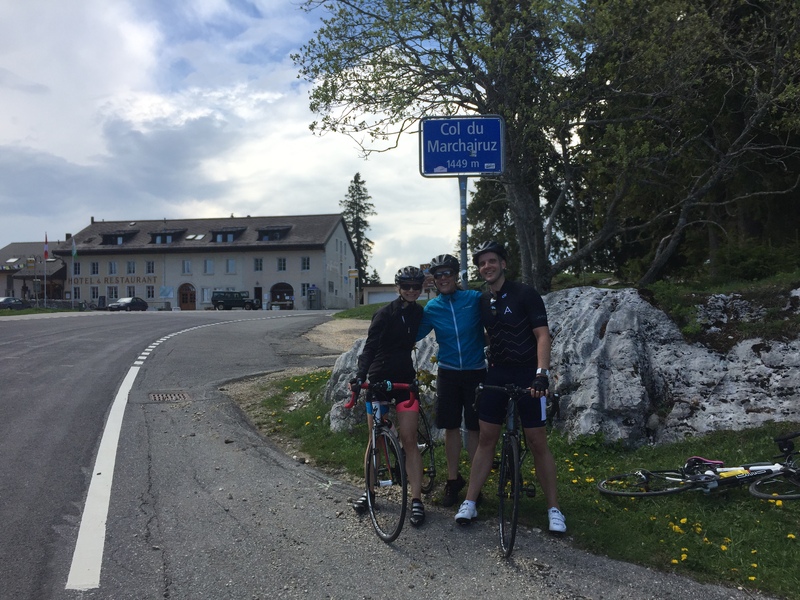 Only a few weeks earlier the Tour de Romandie passed on the same roads, so the camp participants were cycling on the same roads as the pros! We stopped in Berolle at the auberge for a very nice lunch and before leaving I got stung by a wasp! No drama and we could carry on by starting our main difficulty of the day, the ascension of the Col du Marchairuz, reaching 1434m elevation above sea level. The ascent is a 9.6km segment with 700m elevation, and the gradient is very constant throughout. The weather was getting very warm, and I got a really nice cyclist’s tan on my legs! We then headed on the “route des montagnes” following the usual cross country skiing route, and crossing many Alpine chalets, but the cows were not there yet. The views were breathtaking, and we were literally on our own. This is one of my favorite roads in Switzerland. 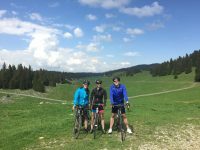 We then descended to back to the lake, following the slopes at the foot of the Jura, crossing picturesque and typical “Vaudois” villages. 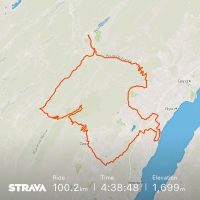 All in all, 101km with 1850m elevation. A great day on the saddle to start our weekend! We stretched on the garden of the Chateau and recovered nicely. We spent the evening in Nyon, sightseeing the old town and its castle, before eating to the oldest pizzeria in town, La Croix Verte to replenish our energy levels for the upcoming days. Earlier start : 8.45am ! The route consisted of a beautiful loop in the Jura and depending on the weather, a potential tour in the Vallée de Joux. 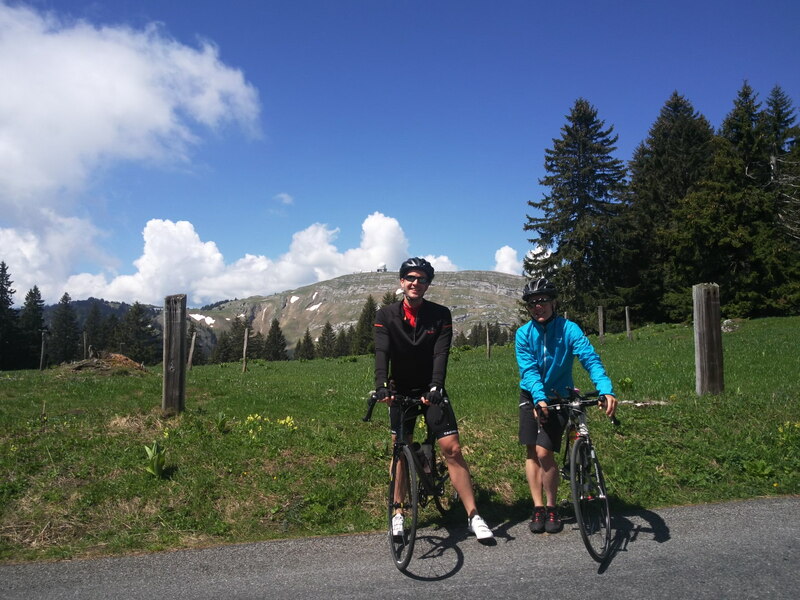 Our first difficulty was the Col de la Faucille, a 10km climb with 700m elevation. The col has been used in the Tour de France in the old days, and it was featuring the following day on the Tour de l’Ain, so the road was fully decorated with signs of “Ici c’est l’Ain!” making sure we know where we were! We descended towards Mijoux, entering the Jura heartland. 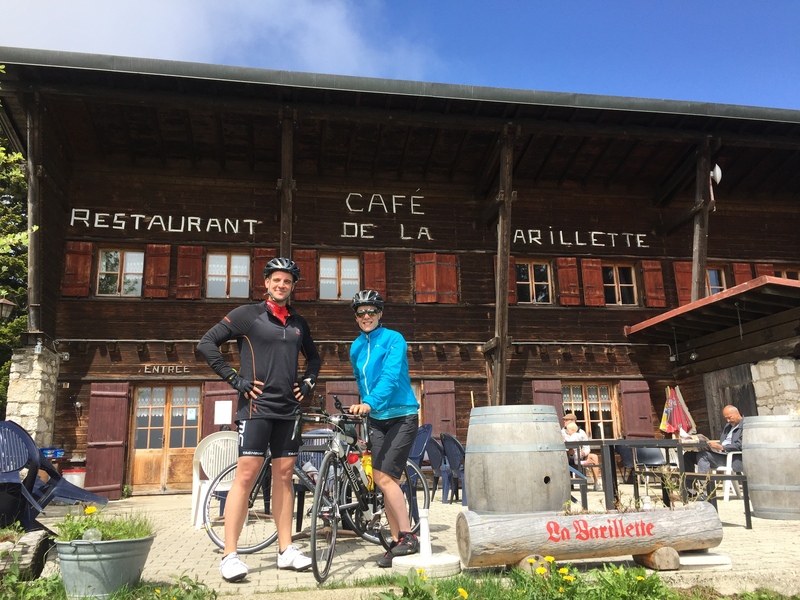 The weather was amazing, and we cycled the beautiful and quiet Jura roads until les Rousses, where we enjoyed a well-deserved coffee stop. 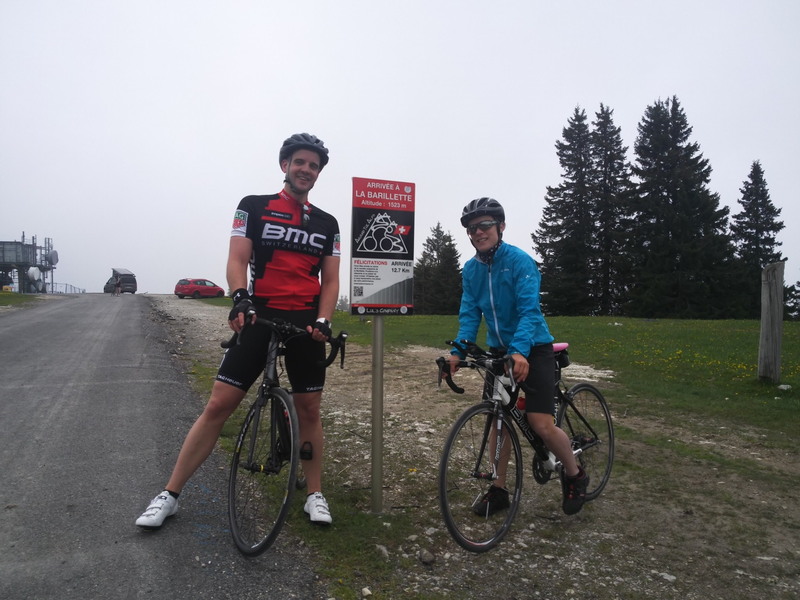 We even cycled on the arrival of a stage from the Tour de France in 2017. 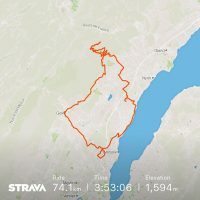 The weather looked grim in the distance in the Vallée de Joux so we decided to cut the course and head back on the other side of the Jura to Switzerland and try to avoid rain. After about 2 minutes on the bike, we got hit by a massive hailstorm… We quickly found shelter under a chalet and let the storm pass. 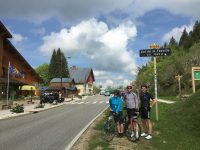 It kept raining a little, but we carried on and reached St Cergue, where the rain stopped and some warmth was appearing again. 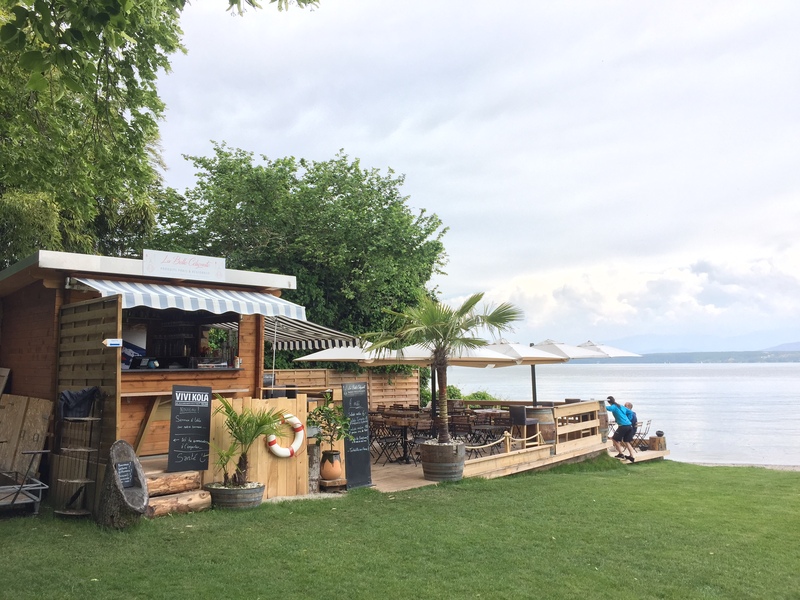 We headed down to Lake Geneva, where we stopped for a coffee on a terrasse by the lake, where I usually swim open water in the summer. Breathtaking view. We returned home clocking a great 100km with 1700m elevation. Considering the weather, this was a great achievement. I introduced the Compex electro-stimulation machine, which triggered a lot of interest, and massively aided our sore muscles. We later on drove to Geneva where we walked around town, mainly in the old part of town before wandering by the lake and finally eating out in a fantastic Lebanese restaurant. Switzerland was playing in the ice hockey world championships semifinals, and Nicole was very excited and nervous always checking the scoreboard, but Switzerland did the impossible and beat Canada, to which we cheered and it concluded another brilliant day. 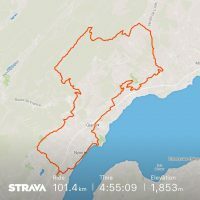 Another early wakeup call but this time with slightly more tired legs… The final day was dedicated to climbing the king of the Jura: La Barillette, a 12.7km climb with almost 1000m elevation. 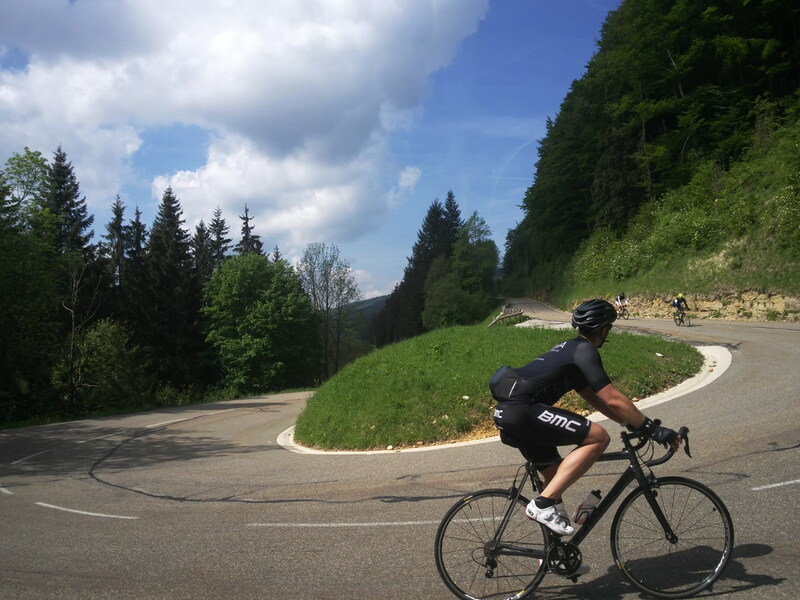 It’s the highest paved road in the Jura chain, and it provides amazing views of Lake Geneva. 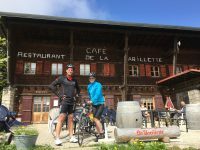 Unfortunately for us, the view was hidden by a big fog, so we rested at the top of the mountain in the Barillette restaurant, a popluar spot amongst cyclists and hikers. 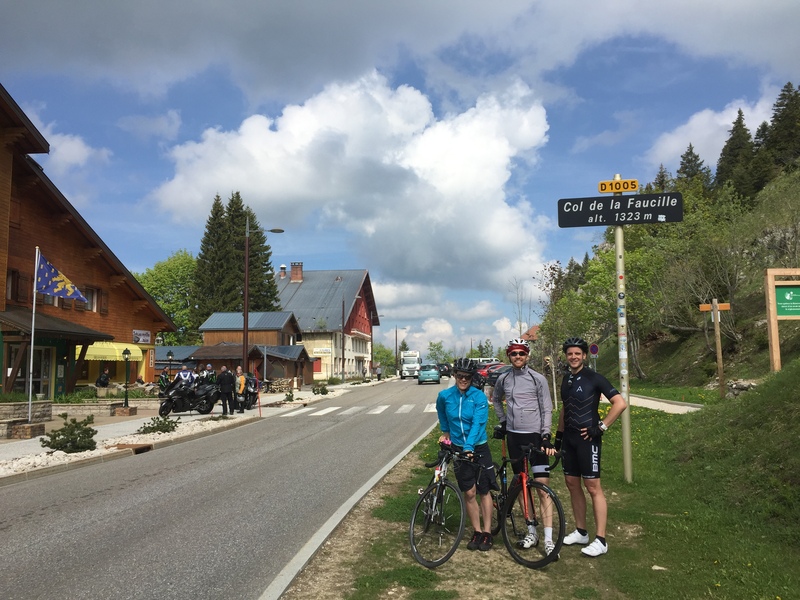 After a warm tea and a slice of apple tart, we descended back to the foot of the Jura, going back to France for a little while around the picturesque villages of Divonne and Vesancy, before heading back to Lake Geneva, and eventually making out way back to the Chateau de Bossey. Another big day consisting of “only” 74km but with 1600m elevation! The weather was perfect, and our legs definitely needed a rest, so we stretched for a while and used again the Compex “training recovery” mode which soothed our sore muscles. 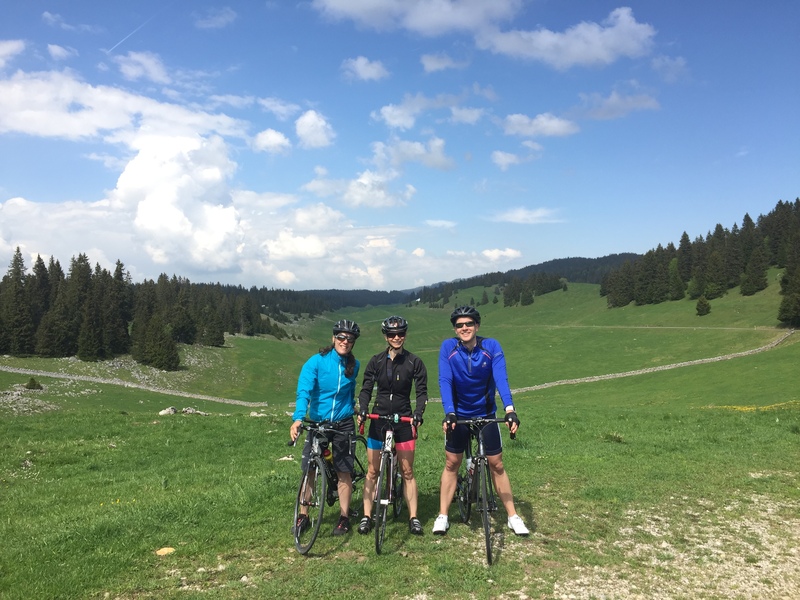 All in all, we rode 275km with 5’150m elevation, in a total of almost 14 hours of cycling. Fantastic weekend and brilliant training bloc for all the athletes, who will return home with amazing memories, new friends, and a perfect preparation for their summer events.